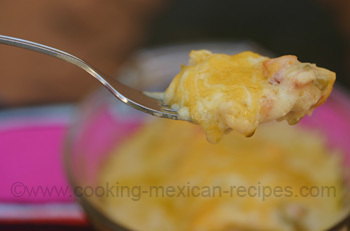 Sour Cream Chicken Enchiladas – “It’s Gotta Be Hot To Be Good!” Tweet this! Many recipes for sour cream chicken enchiladas contain cream of mushroom soup or cream of chicken soup. While that may taste okay, you won’t find canned soup in this recipe. The wonderful rich flavor for this recipe is the result of sautéing the onions and garlic and adding green chiles, fresh tomatoes, chicken broth and of course sour cream. There are some options for the chicken in this recipe. While the recipe calls for 2 cans of chicken breast, you can use a rotisserie chicken or even bbq some chicken breast and use that. Some people like their chicken shredded, while others like it in chunks. I prefer chunks. You can prepare it either way depending on your preference. Okay, let’s get on with this easy sour cream chicken enchilada recipe. Dip two corn tortillas at a time in the hot oil. Leave them in the oil for only a couple of seconds. You don’t want them to get stiff. You can dip them in the sauce and then onto a plate. Remember, it’s the sauce that makes it. Bake in a 350 degree F. oven for 15 minutes or until nice a bubbly. Click here to watch my Sour Cream Chicken Enchiladas video. This dish would be so nice with some Spanish rice and refried beans and guacamole. A margarita or sangria might be in order as well. Add some dessert and you’ve got a feast. Yum.